Here is a bit of business advice handed down to me by my father when I was 16 years old. If you want to have work the rest of your life, be willing to do the dirty work that no one else wants to do. He told me this just before he let me know that he had agreed to clean all of the windows on a home where an old widow lived. She was unable to clean her own windows and did not know where to turn. There were years of dirt on the windows – to the point you could not see out of them any longer. He learned of her need, agreed to do the job, and then handed me a bucket and a roll of paper towels. In other words, I was hired before I filled out the application! Behind every golden idea, there is a list of jobs that no one wants to do. However, that is where the real gold is to be found. For example, in 1849, the California gold rush sent some 300,000 prospectors westward to dig for gold. The real business winners from the gold rush were the boarding house owners, most of them women, who provided menial tasks such as preparing meals and sewing clothes for the 49ers. A German immigrant named Levi Strauss began to turn out denim pants from his dry goods store and they became a favorite of the miners. They called them blue jeans. Levi Strauss did the work no one else wanted to do and created a fashion craze that is still with us today. Alan and Robert Pinkerton formed a detective business when railroad business began to grow in the mid-19th century. When criminals began to rob trains, the Pinkertons were called upon to make sure that if anyone attempted to rob a train, they would not get away unscathed. The Pinkertons were key in tracking down some of the most notorious criminals of the 1800s like Jessie James, the Reno Gang, and Butch Cassidy. They began to offer bank security, business property protection during union strikes and detective work for high government officials. This was all before there was a Secret Service, FBI or CIA. The Pinkerton Agency grew to have more employees than the U.S. Army in the late 19th century. Security was dirty work. Think about more recent examples. My trash is picked up every Friday by trucks from Waste Management, the largest trash removal business in North America. I am one of 27 million customers who have them take away trash each week. It is cold and flu season. What do you use to blow your runny nose? A handkerchief in your back pocket, or Kleenex, the disposable facial tissue? Kleenex is a brand of the Kimberly-Clark Corporation, a multi-billion dollar corporation with 56,000 employees who are making a living doing your dirty work. We are nearing the end of the year and the beginning of 2014. The economy is still sluggish in many sectors. What that means for many people is that they will lose their jobs in the next month. This leads many people to consider a career shift. Some will contemplate going in to business for themselves. If that is your situation, keep this in mind: the jobs that last are the ones that fill an indispensable need. There are many services people don’t want to perform for themselves. Focus your efforts there. Many times these jobs outlast their original employers. I explained earlier that the Pinkerton Agency grew out of a need for railroad security when the rails were the main form of travel across the U.S. Security work has outlasted personal travel on railroads as a viable business. Today the security business the Pinkerton brothers started is a $1.5 billion corporation. Do you need a career shift? Understand the common needs of people. 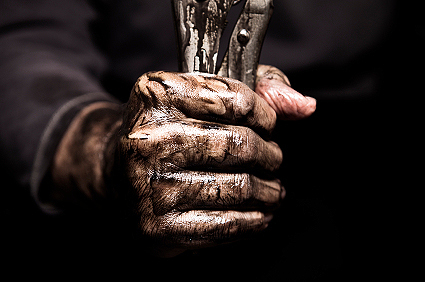 Find out what the dirty jobs are and fill a service that no one else wants to do. Do you want a new product line that will have a long sales life? Sell the product that solves a dirty problem. Do you want to start a successful business? Find your niche in providing the products or services no one else wants to touch. If you want to have work for the rest of your life, be willing to do the dirty work that no one else wants to do. It was wise council at 16. It is still good business advice.